Dance Commentary by Heather Desaulniers: American Conservatory Theater - "A Christmas Carol"
American Conservatory Theater - "A Christmas Carol"
American Conservatory Theater's annual production of “A Christmas Carol” has something for everyone: fascinating dramatic elements for the theater critics; unique vocal selections for the musicians; cool stage effects for the techies and for the dance lovers, clever movement sequences that add significant vitality to this famous holiday story. I wouldn't call this particular adaptation of Charles Dickens' tale a musical, but the two hour production does have a good helping of music and dance. For me, the mark of good musical theater is when the scenes and dances truly meld together. The movement should organically emerge from the action so that the trajectory of the scene continues to move forward - awkward transitions make dance look like a peripheral element that doesn't belong. 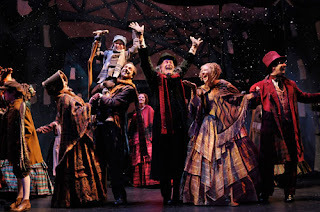 Choreographed and contributed by Val Caniparoli, the dances in “A Christmas Carol” were perfectly incorporated into the staging. 'Christmas past' journeys through the life of a young Scrooge, with one of the visions recalling Christmas Eve at the Fezziwig Warehouse, a textile plant. In true holiday fashion, his employers, Mr. and Mrs. Fezziwig, are throwing a festive soiree for their staff with food, drinks and of course, dancing. Caniparoli smartly delivers a joyful, circular partner dance to embody this social event, well-suited to both the tone and the revelers. His folk dance looked to be a regular part of the character's cultural and social make-up (as if they had learned the dance as children), opting for simple footwork with unexpected additions - quick ball-changes with coordinating head tilts. The opening of Act II provided a similar moment of cohesive whimsy with the produce sellers scene. The series of inventive dance duets made this vignette fun and playful as the Spanish onions, Turkish figs and French plums were transformed from 'food' into personalities. 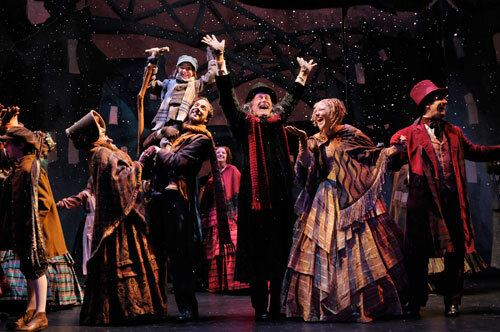 Most of the actors in “A Christmas Carol” were not trained dancers and so it was imperative that the choreography not be overly complicated. To that end, Caniparoli worked with an economy of movement, giving the performers simple, accessible yet dynamic sequences. This allowed them to remain in character while successfully and confidently performing the set dances. Because Caniparoli possesses a talent to match movement and mood all while keeping the technical capabilities of his cast in mind, it would have been nice if there had been a little more dance present in the play. Fred's party in Act II would have been another wonderful opportunity to highlight Caniparoli's choreography.